Field work is both exciting and empowering. The different perspectives and sources of information currently available will challenge any research student or expert. I call this exciting and empowering experience ‘the grassroots teacher’, like the teacher we all have who tells unforgettable stories. This is precisely the experience of a field development worker who undertakes a research assignment. We often come across citizens who are willing and open to share their life stories. This openness means more people across South Africa, SADC and the world can have access to accurate information. 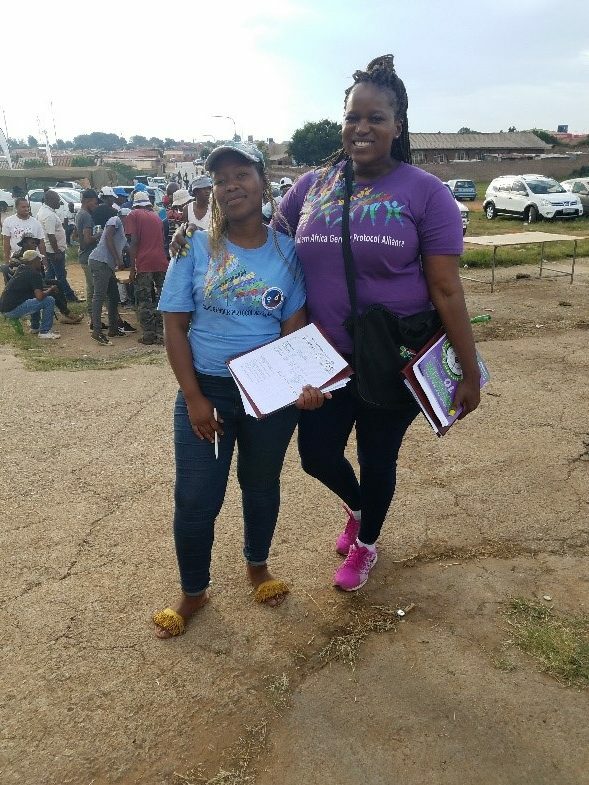 I recently worked in Soweto townships where I was collecting monitoring and evaluation (M&E) data to update the 2018 SADC Gender Protocol Barometer for South Africa. This face to face process of collecting data is guided by a pack of questionnaires to be completed by citizens who sometimes ask difficult questions or comment on published statistics or stories in the gender protocol barometers. I remember many people asking for money or for some kind of kick back for participating in the survey, many who did not want their pictures taken and some who wanted their stories to be printed in the barometer. When collecting this data, I think of creative ways to make the protocol relevant to everyone, regardless of their gender, race or class. I recall one situation from my recent visit in Meadowlands (Soweto) when I was standing on a street pavement holding the SADC Gender Protocol 2018 Barometer. Adjacent to the pavement is a sports field full to capacity where a soccer tournament is taking place. With me is a group of five young and middle aged men, each completing the twenty-five questionnaire on gender attitudes. This type of scenario requires participants to tick what they believe is the most appropriate answer as and when I ask the questions. The scenario also requires me to maintain strict levels of confidence and stamina assist participants and to engage in a lot of uncomfortable conversations without losing the purpose of the group exercise. After the group exercise I embraced the empowering experience of the grassroots teacher with a nudge on my shoulder and a conversation to self. I started thinking about creative ways to recruit interns and citizens that would participate in the 2019 M&E task. I started to get really excited again about my role at Gender Links and about how I will spend many months and considerable energy, resources and brain power working on proposals and reports to present issues faced by particularly vulnerable groups in poor communities, and how this work would be valued, understood, or utilised by individuals, organisations and governments that needs the data. Administering the SADC Gender Protocol M&E survey is like looking through the microscope that enables one to see more clearly the many levels of dimensions of South African citizens; their vulnerability and blatant criticism on existing policy gaps in respect to gender and development. One of the hardest things though, for field development workers, besides feeling completely expendable at the whim of time, is the ability to have the courage and resources to ensure your work is taken seriously. It is hard to watch the work done put on shelves and not used or integrated at all into government and civil society organisation (CSO) strategies. Therefore the next steps are undoubtedly to obtain contributions from local and district councils and the civil society on how barometer results can be reflected into existing programmes not only to meet the tax payers’ or donor expectations but to impact citizens in positive ways.